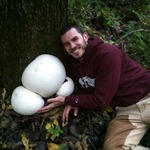 I am a botanist and mycologist with a background in forestry and a professional interest in plant pathology. I am attracted to scientific problems whose solution would provide for an improved environment while addressing the needs and concerns of the human population. The Narcissus Flycatcher genome project: Evolution's imprint on the genome. These two mature American chestnuts are in the Pisgah National Forest in North Carolina. Trees like these are extremely rare. Endophytes collected from these trees were included in this research. Living American chestnuts are easy to find throughout the Appalachian mountains. The blight fungus only affects the above ground portion of the plant, leaving the ancient root-stalks of these former giants to continue living by continually sending out new, short lived stems. Can fungal endophytes protect American Chestnut (Castanea dentata) from blight (Cryphonectria parasitica)?